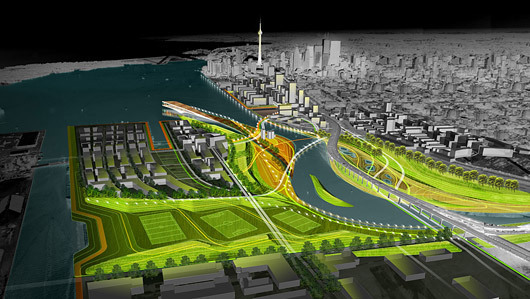 Wandering Ecologies, Weiss/Manfredi‘s design proposal for Toronto’s Lower Don Lands, has won the American Architecture Award. 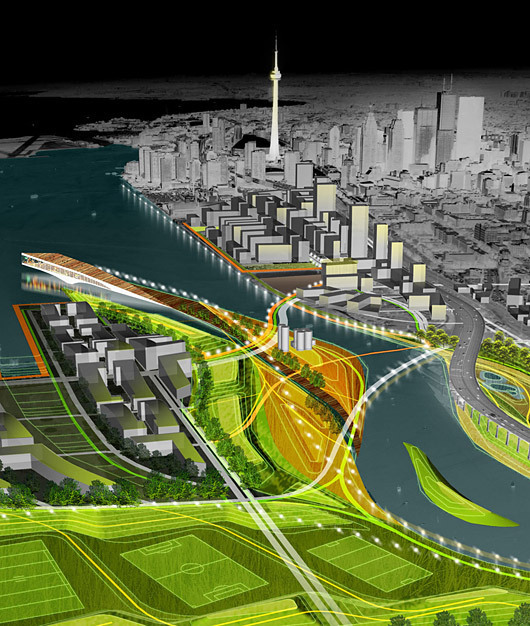 The design renaturalizes the Lower Don River and establishes a new identity for Toronto, where recreational, cultural, and residential activities are free to wander and overlap, creating a new model for sustainable waterfront expansion on the eastern edge of the city. Urban life and nature are conceived as reciprocal conditions that together will reclaim infrastructure and transform Toronto’s Lower Don Lands into a new cultural and ecological paradigm. The essence and potential of Toronto’s Lower Don Lands will celebrate multiple ecologies: city and water, infrastructure and landscape, destination and retreat. The 2009 American Architecture Awards recognize distinguished projects designed and built in the United States by leading American and international architecture firms. Established in the 1990s by The Chicago Athenaeum: Museum of Architecture and Design, together with The European Centre for Architecture Art Design and Urban Studies and Metropolitan Arts Press Ltd, the awards program honors and celebrates the most outstanding new achievements and innovations for new architecture.